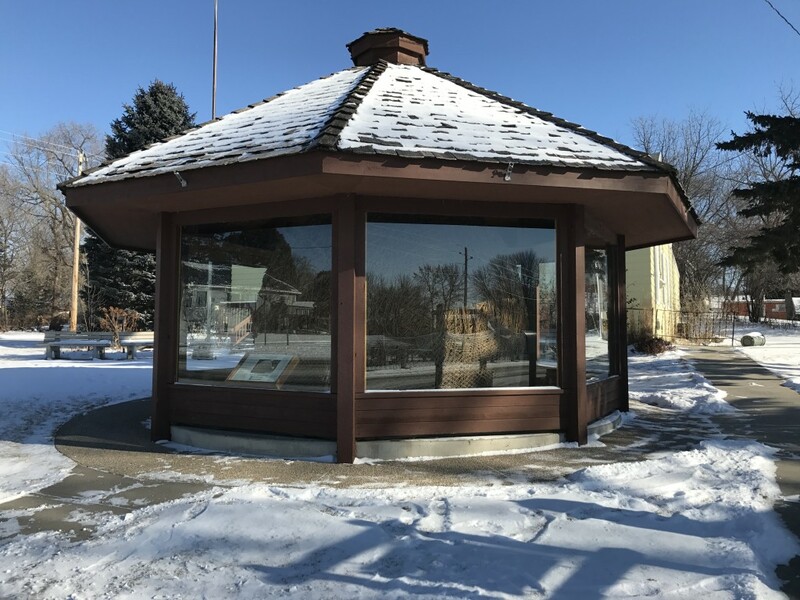 40 feet in circumference, 11 feet tall, 12 feet in diameter and weighing in at over 11 tons, the World’s Largest Twine Ball is housed in a wooden gazebo with plexiglass windows, in the farm town of Darwin, MN. Started in 1950 by local farmer Francis Johnson, this labor of love took 30 years of solo twine-rolling in his basement for up to 4 hours a day. It got to the point where he needed railroad jacks to move it to maintain its spherical proportions and was eventually moved out to the barn. Ten years after its completion, Johnson passed away in ’89. It is generally accepted that he died from emphysema from inhaling twine dust for roughly 30 years. It’s always the little things that get you in the end. It was moved into town in 1991. 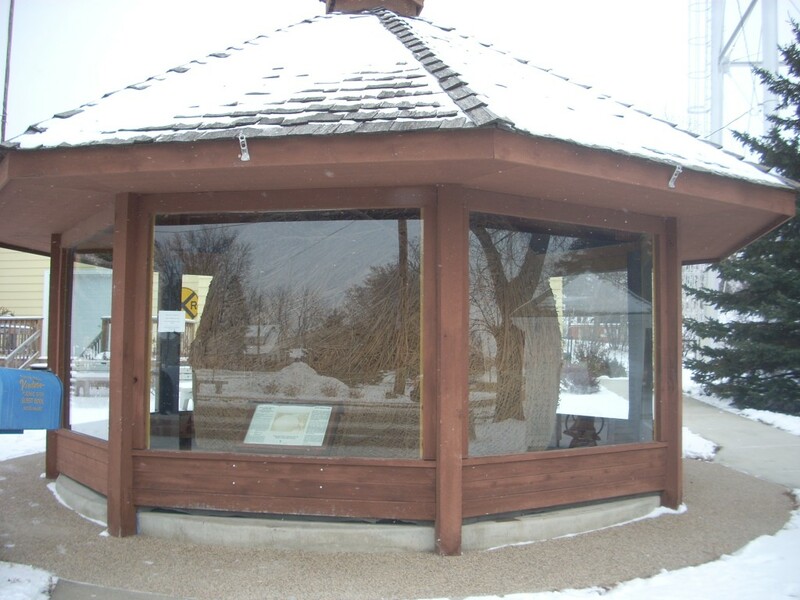 The twine ball is on display right in the middle of town next to a souvenir shop that never seems to be open. 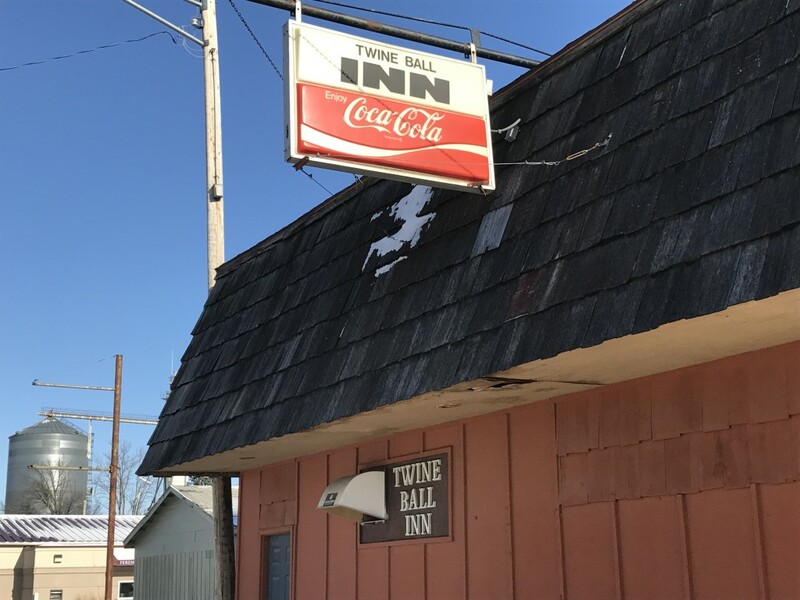 The tiny little prairie town is also home to the Twine Ball Inn, the local cafe. Each year in August the town celebrates Twine Ball Days. It’s famous too, being mentioned in a Weird Al song as well as appearing in National Lampoon’s “Vacation” in the opening montage. *No article on this colossal creation is complete without mentioning that in 1994 its legacy was surpassed by a larger twine ball in Cawker City, Kansas. However, that one was a group effort. 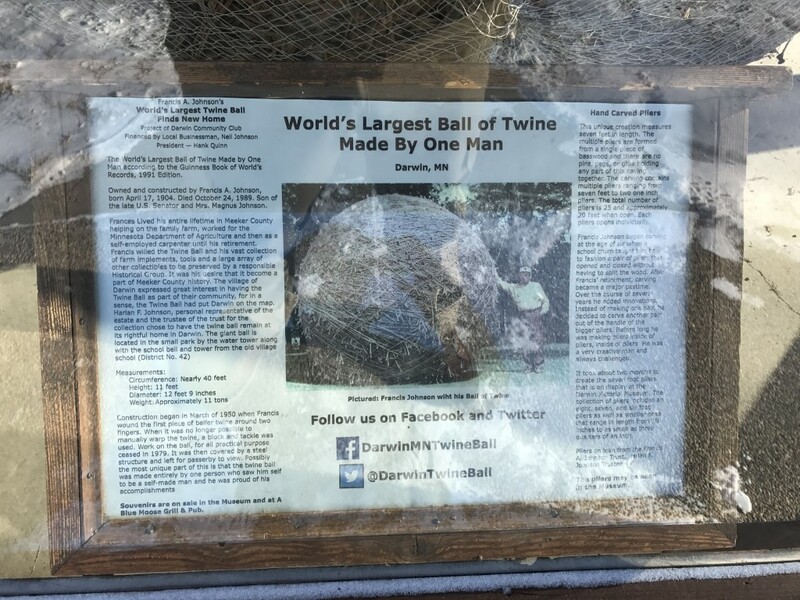 So our home state’s effort remains the Largest Twine Ball **built by one man**. Therefore, Minnesota still holds the title, in our opinion. There is also one in Branson, Missouri and one somewhere in Wisconsin. But sometimes you just can’t beat a classic. It’s the real deal. 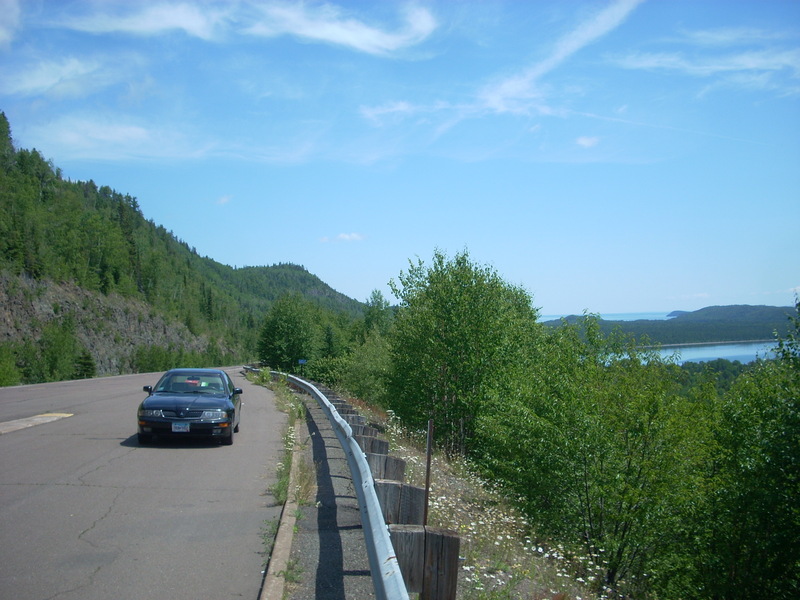 Just another day in Minnesota Roadside Attraction-land. While in the area: Ummm, you might have to make your own fun out in this area. Not much going on. However the Twin Cities are only about an hour away, and Willmar isn’t far. 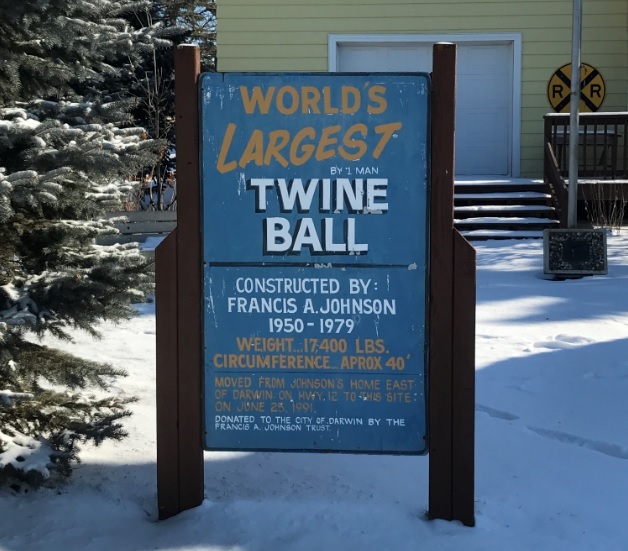 This entry was posted in Highway Highlights and tagged Darwin, Minnesota Marvels, MN, Roadside Attraction, Twine Ball by Seth5544. Bookmark the permalink.